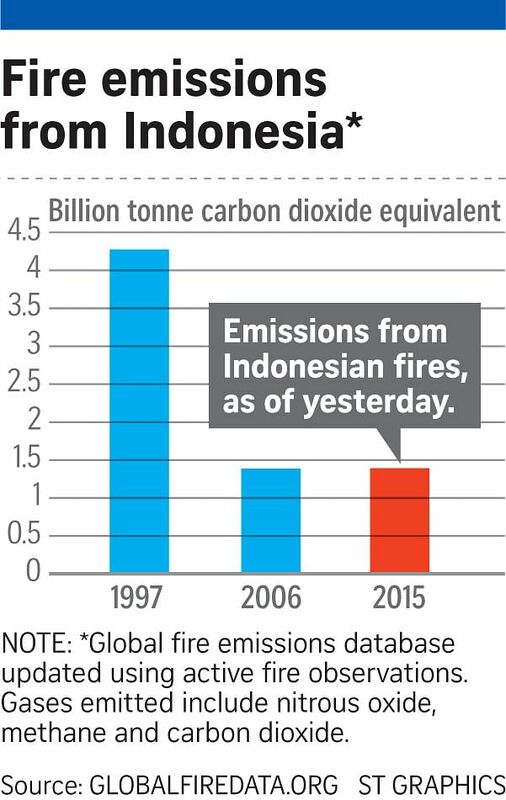 Emissions from forest and land fires in Indonesia have rocketed in the past two weeks and will today surpass the total emissions for the 2006 fire crisis, the country's second-worst on record, according to an analysis of Nasa satellite data. Fires have raged across large parts of Indonesia, particularly Sumatra and Kalimantan, for the past two months. Over the past two weeks, total emissions have soared from nearly one billion tonnes to nearly 1.4 billion tonnes. The Washington-based World Resources Institute (WRI), using findings from the Global Fire Emissions Database (GFED), said in a recent report that since early last month, carbon emissions from the fires had exceeded average United States daily output on 26 out of 44 days. The US is the world's No. 2 carbon polluter after China. Much of the burning is in peatlands rich in carbon but which are being drained and cleared for agriculture, particularly oil palm and pulpwood plantations. Very few fire episodes globally, except Indonesia's 1997 fire crisis and massive fires in the Amazon early last decade, compared to what is occurring now, said Dr Guido van der Werf of the Faculty of Earth and Life Sciences at Vrije Universiteit in Amsterdam. "This is a different magnitude," he said. Dr van der Werf analyses daily hot spot data from National Aeronautics and Space Administration satellites and is a specialist in estimating greenhouse gas emissions from fires. He has been running daily analyses on the blazes in Indonesia for the GFED. Along with emissions, the number of fires has soared as well, with Dr van der Werf's team recording more than 108,000 since the start of this year. His analysis for yesterday showed total emissions to be just a fraction under the 2006 total and expected the number to easily exceed 2006 levels by today. With no rains expected until year end, Indonesia is rapidly closing in on the emissions record set in 1997, when haze produced by its worst forest fires blanketed large parts of South-east Asia. Experts warn that the current outbreak is on track to become the worst ever, exacerbated by bone- dry conditions caused by the El Nino weather phenomenon. That could hurt Indonesia's climate emissions reduction pledge for a major United Nations climate conference in Paris in December. Carbon dioxide is the main greenhouse gas blamed for driving climate change. "The burning of tropical peatlands is so significant for greenhouse gas emissions because these areas store some of the highest quantities of carbon on earth, accumulated over thousands of years," WRI said. Dr Herry Purnomo, a scientist at the Indonesia-based Centre for International Forestry Research (Cifor), told Agence France-Presse this week that climatology data indicated the rainy season may be delayed and that the fires could last until year end. Yesterday, a Meteorology, Climatology and Geophysics Agency official also predicted the rainy season, which normally starts in November, would be delayed until December, Tempo.co reported. The fires could also be producing more emissions than estimated. "My guess is what we are going to see out here is much higher emissions than from your average fires," Dr Louis Verchot, Cifor's director of forests and environment, told The Straits Times last week. Global NGO Wetlands International, in a position paper yesterday, urged Indonesia to adopt better peatland management practices. It also said Indonesia needed to develop a national peatland conservation and restoration strategy. It recommended that Indonesia restore and conserve unused peatland, stop further drainage, block existing drainage canals and phase out drainage-based plantations, among other measures.